5.92 Carats total weight round brilliant cut diamond stud earrings in a unique 18K yellow gold open basket style setting with friction posts and jumbo backs. Diamond quality: O-P VS, O-P VS2. 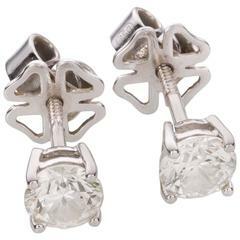 4.80 Carat total diamond weight of various shapes set in 22K yellow gold earrings with friction and omega backs. 23.97 Carat total weight of round brilliant diamonds set in 14K yellow gold necklace with a total length of 23". Diamond quality: J-L color, S1-I1 clarity. Very good to excellent cut. 14 karat white gold stud earrings consisting of 2 round brilliant cut diamonds having a total weight of .72 carats and having a color and clarity of I/VS2-SI1, respectively. 14 karat white gold stud earrings consisting of 2 round brilliant cut diamonds having a total weight of 0.74 carats and having a color and clarity of I/SI1, respectively. 14 karat white gold stud earrings consisting of 2 round brilliant cut diamonds having a total weight of 0.72 carats and having a color and clarity of I/VS2-SI1, respectively. 14 karat white gold stud earrings consisting of 2 round brilliant cut diamonds having a total weight of .64 carats and having a color and clarity of J/SI2 respectively.